Bayer Advanced Termite and Carpenter Bee Killer Plus Foam kills termites you see and those you don't see on contact. Its broad-spectrum foam expands to cover hard-to reach areas both indoors and out. Can be used on lawns, landscapes, foundations, decks, patios, wood piles and wooden elements in basements, crawl spaces, attics, decks, fencing and other listed areas. 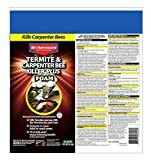 This product also kills Carpenter Bees, Wood-infesting Beetles and other listed pests. 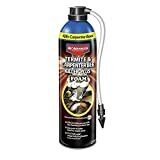 Interested in the BioAdvanced 700420A Termite & Carpenter Bee Killer Plus Foam Pesticide, 18 oz Spray? Is the price too high? You can easily price watch this product and we'll notify you when the price reaches your target.